A little girl is determined to cure her dog’s hiccups. With eyes squeezed shut and snout in the air, Oscar the dog can’t stop “Hic! 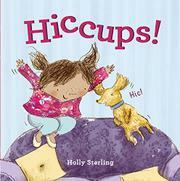 Hic!” hiccupping! Ruby has many ideas. “Why don’t we try dancey-dancing, like this?” she suggests as they both shake and twirl. Or perhaps a “jumpity-jump” on the couch will help? They also “slurpity-slurp” water through a straw, and “munchy-munch” a handful of cookies, to no avail. (The tendentiously cute verbs can seem a bit much, but they are actually quite a lot of fun to read aloud.) Luckily, Ruby has one more idea. And it works! Until a tiny “Hic!” escapes Ruby’s lips as well—prompting an immediate repeat read. Perhaps the “dancey-dancing” will work for her. Brown-skinned Ruby is a picture of pure child exuberance as she invents creative and unusual ways to find a cure. Her messy mop of penciled pigtails echoes Oscar’s scribbled, furry ears as they frolic and play.